Reinhard Margelisch founded the design studio prodis-design GmbH in Switzerland in 2007. As the basis of his future work, he defined 4 pillars on which his future business should rest. His business philosophy includes social responsibility, ecological aspects, economically effective products and the opportunity for creative development. These pillars form the core from which all future work should proceed. Before Reinhard Margelisch began studying economics and political science at the University of Bern, he undertook an interior design internship in New York. A very formative time for him, as he still tells today. As a young lad, new worlds of creatively working people, such as architects and artists, were opened to him, so that his previous thought pattern was shaken up. Back in Switzerland, he began his studies, which he initially financed with the creation of sculptures in his studio in an occupied house in Bern. Also attracted him during his studies, the financial industry. He founded his first company as an investment broker, which he held for eight years. When he was hit by a car on a summer night, a decisive turning point came into his life. With a double leg fracture he had much time for self-reflection for nine months in great immobility. The question of meaningfulness in his actions began to occupy him. He realized that he wanted to set out for new shores. With the 4 pillars defined for himself, he embarked on a three-month journey to India. Arriving in Delhi, overwhelmed by crowds, noise and waste, he set out for Kerala, southern India. The idea of making something useful out of waste in Delhi did not let him go. In a week's train journey back to Delhi, he realized that he wanted to create bags of waste materials. One contact led to the next, so that after a few days he stood in a small run-down factory. Here he decided to take over the manufactory, which consisted of five people, and to set up and expand it for a bag production. In 2007, the foundation stone was laid for his first bag brand VARGU. Base material of the brand VARGU became tire tubes of waste. VARGU means variations and arguments - and so in the naming the 4 pillars were integrated, which remain the basis of his further work. In 2009 he founded the brand 7clouds, which began as a commissioned work. 7clouds stands today for simple designs of tarpaulin (boat tarpaulins), combined with applications in leather. The focus here is on the shaping of a rigid material and the love of detail work. 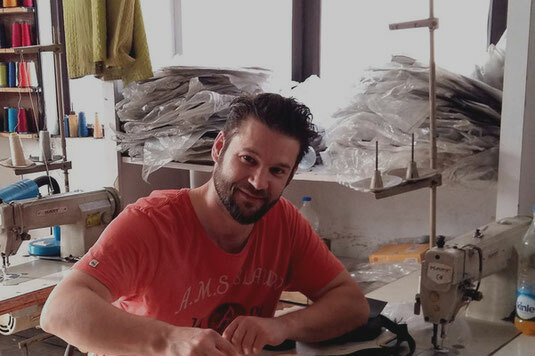 In 2010, the brand MARGELISCH joined because he had the strong desire to work with leather, which opened up new challenges and a large learning environment. Reinhard Margelisch created several brands, because he wants out of the desire to play with different materials, each brand wants to give its own face. Since the end of 2016, the entire production of the brands takes place in Kalkuta (India), as the production site is directly linked to leather production. This provides optimal traceability of the raw materials and product development. The attitude, based on the 4 pillars that underlie our product development, we always try to adapt to our entire business process. It is important to us to keep our actions from production through our team, to retailers, to the end user. Fair dealing is therefore the focus of our entire value chain.